Ever since I was a little girl, I was aware that Remembrance Day was very important. As a member of Girl Guides, I was able to take part in our local Remembrance Day ceremonies and was even fortunate enough to be in the colour party a few times, presenting our flag at the front of the ceremony, surrounded by cadets and veterans. Although I was involved with these ceremonies, I felt like I did not understand the horrors of which these brave men and women fought, many losing their lives. To this day, I still feel that I have no comprehension of these experiences but I am thankful for that. My experiences over this past year have given me a different perspective. While in Europe I visited the Anne Frank House in Amsterdam. This was an emotional experience for me. Many of us are aware of the story of Anne Frank and her family who hid in an Annex before being taken and placed in concentration camps. For some reason I didn’t feel like I could connect personally with her story. I have never had to endure anything even close to those hardships. But then I remembered, my grandfather was stationed in Holland during World War II. That was there. He was here. The man who never told me about his time abroad but sang war songs while doing house work. He came home from that war, met my grandmother and started a family. Too many people were unable to do the same. Suddenly, it felt too real. The next day we went to the Dachau concentration camp in Germany. Every year at school we would learn about these places. There are so many movies about the horrors that happened in these awful places. Regardless of all of that, I had no idea how much it would impact me to stand there in the middle of this camp and knowing what happened to so many people who were forced to be there. I became numb. Walking around, seeing the different buildings, the pictures, the chapels was all incredibly overwhelming. I still struggle to understand how anyone could possess so much hatred for group of people because of their faith. During this trip we saw quite few national war monuments. Something about the tombs of the unknown soldiers made all of our countries relatable to each other. It doesn’t matter where we come from, there have been wars and fallen soldiers who fought to defend our rights, freedoms and homes. To further the resonance, on our final day abroad we drove past Vimy Ridge. For those who do not know, Vimy Ridge is a war monument in France, erected near Calais. The monument is in remembrance of the battle at Vimy Ridge where Canadian soldiers helped overtake the German high ground that was there. Being so far from home but seeing this spot that is important to our national history was pretty cool. Because of these experiences, this Remembrance Day means more to me than others in the past. This great country that I am lucky enough to be a citizen of may not have has much history as places like Germany, Russia or Egypt but we do have a history that got us to where we are today. I have so many freedoms that I would not have been privy to without that history. It’s not that I didn’t understand these things before, but standing in places where this history took place made it really sink in. 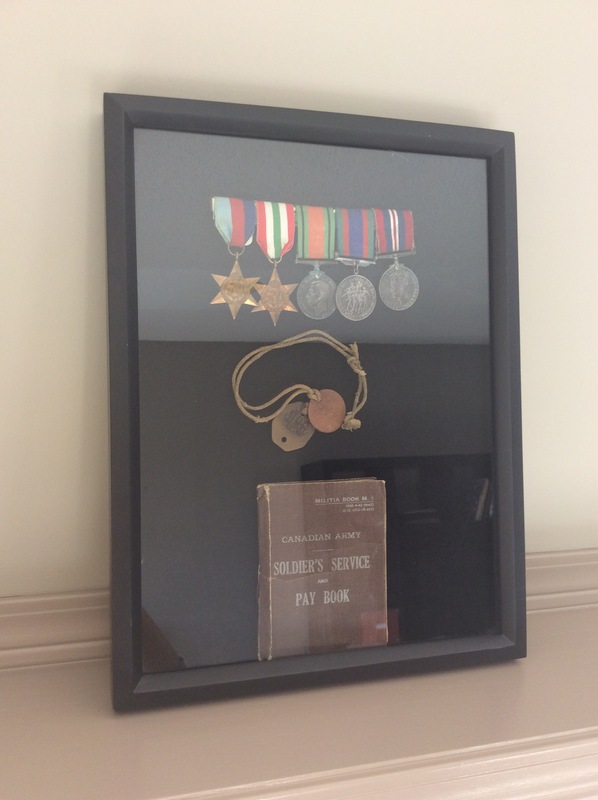 A few weeks back my dad and I put my grandfather’s dog tags, medals and army book into a shadow box. I know that it is something simple, but I am proud to have those items on display to remind myself of the hardships of war and how lucky I am to live in a place that is not torn apart by war. It is important not to take those things for granted. Whether or not you know someone who served, it does affect you. It affects each and every single one of us. Today is just one day to recognize that but I think it is something that we should carry with us everyday. Lest we forget.